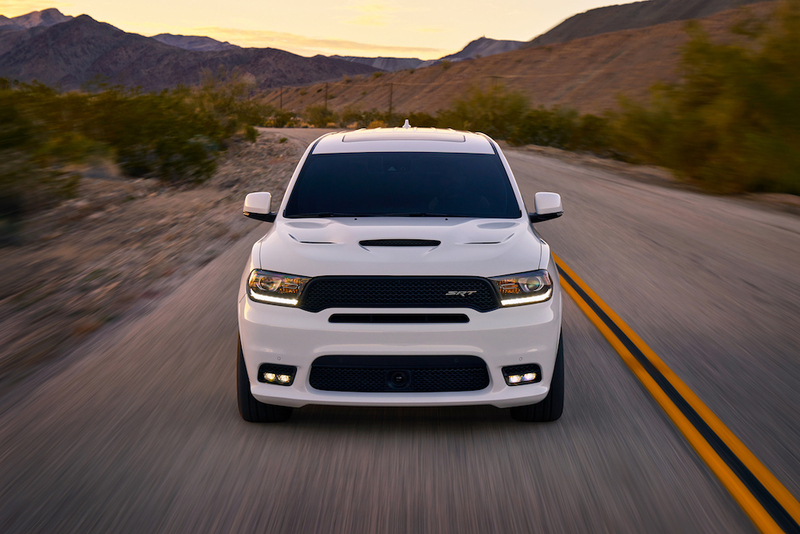 New | 2018 Dodge Durango SRT | HEMI muscle for the whole family! Ever felt the need to subject five other people to the gut-wrenching sensation of being in a Hemi-powered muscle car? You’re in luck! Does everything in the Dodge lineup really need a 392-cubic inch HEMI V8 engine? Where does this all stop? 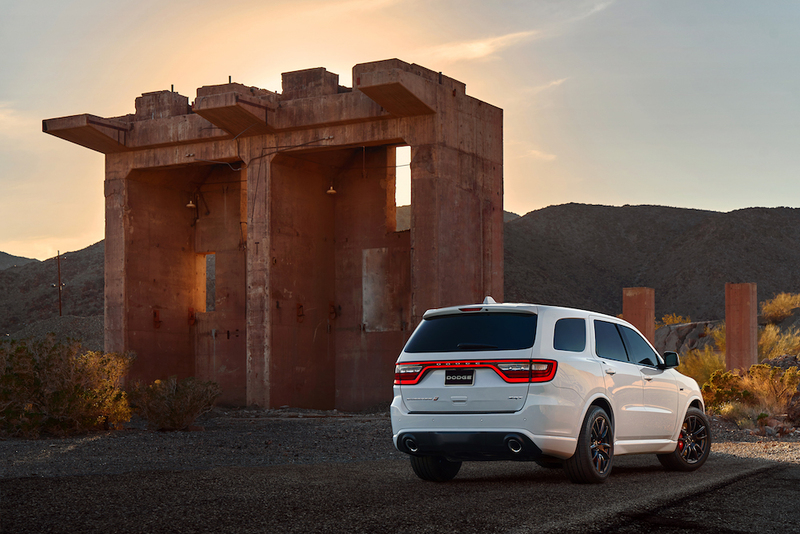 With the Durango SUV gaining the 6.4-litre engine, it now means 60% of Dodge model range in the USA comes with the option of that big ‘Apache’ motor. In fact, the Detroit company only needs to wedge it into the Journey crossover, and Grand Caravan MPV, to have complete coverage. 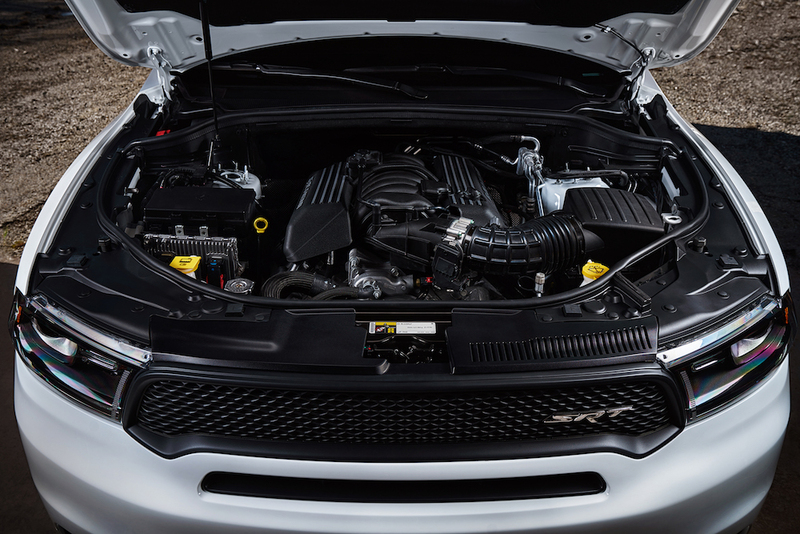 Until now the biggest engine on offer for the Durango was just the 5.7-litre (345-cubic inch) V8, producing 360hp and 390b-ft of torque. The new SRT goes much further, with horsepower upped to a faintly ludicrous 475hp and a corresponding 470lb-ft of twist. That’s sufficient for 0-60mph in just 4.4 seconds – a figure aided by the four-wheel drive system and eight-speed automatic transmission. Oh, and there’s a standard launch control just in case you need a hand getting off the line. We’re pleased to find that the auto’ gearbox features a sport mode that reduces shift times by 50%, and sends up to 65% of torque to the rear wheels. Hitting sport also means stiffer suspension setting and adds steering feel. If you’re feeling really brave, there’s also a track mode which results in even faster shifts, more torque to the back wheels, and the stiffest suspension settings. 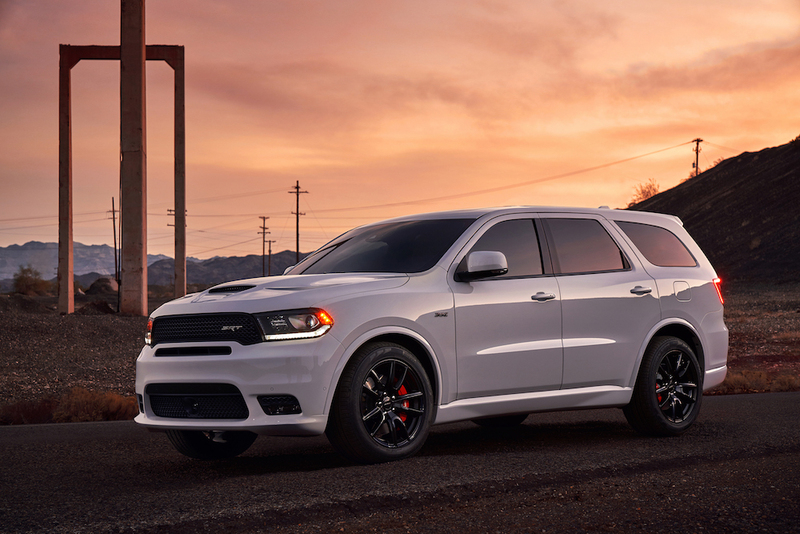 The National Hot Rod Association has certified the Durango SRT as being capable of running a standing quarter-mile in 12.9 seconds. For reference, the Dodge Challenger Hellcat manages the same distance in 10.8 seconds, but under 13 is probably fast enough for something with three rows of seats. Oh, and it’ll also tow 8,600b of weight – that’s 3,900kg! Braking is suitably effective, with six-pot Brembo brakes at the front with four pot calipers at the rear. Bilstein adaptive damping aids the suspension, and there’s also the option of 295/45/20-sized Pirelli Scorpion Verde tyres. The latter are encased in widened wheel arches, with a corresponding aggressive bodykit and SRT bonnet to make the Durango look as aggressive as it should. A performance exhaust system, modelled on that used by the Charger Hellcat, ensures the bark matches the visual bite. 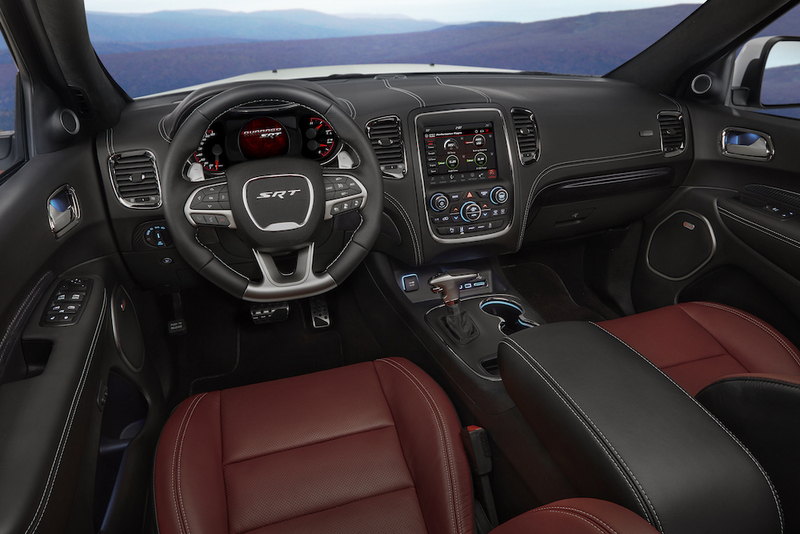 Inside are features such as an SRT flat-bottom steering wheel, heated and ventilated seats, a leather-wrapped dashboard, and the option of genuine carbon fibre interior trim. There’s also the rather big deal of a speedometer that goes all the way to 180mph – although Dodge is yet to confirm an actual top speed. 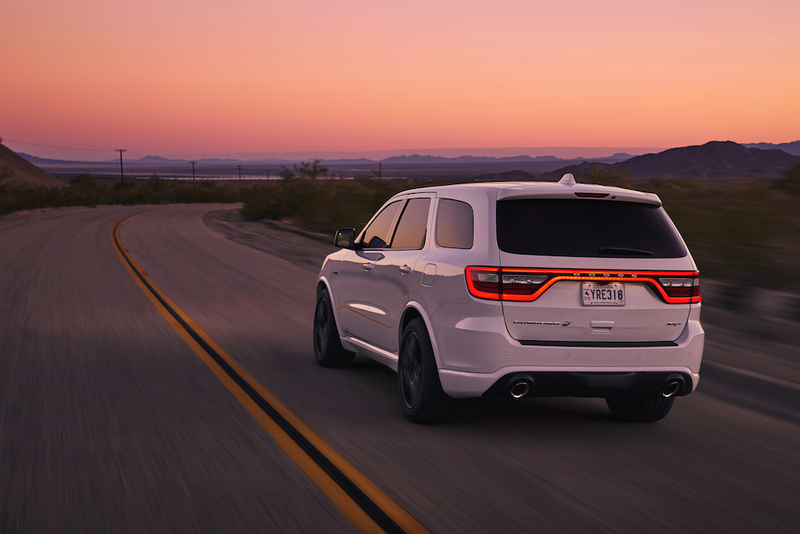 Buyers of the Durango SRT also get a free one-day session at the Bob Bondurant School of High Performance Motoring in Arizona. 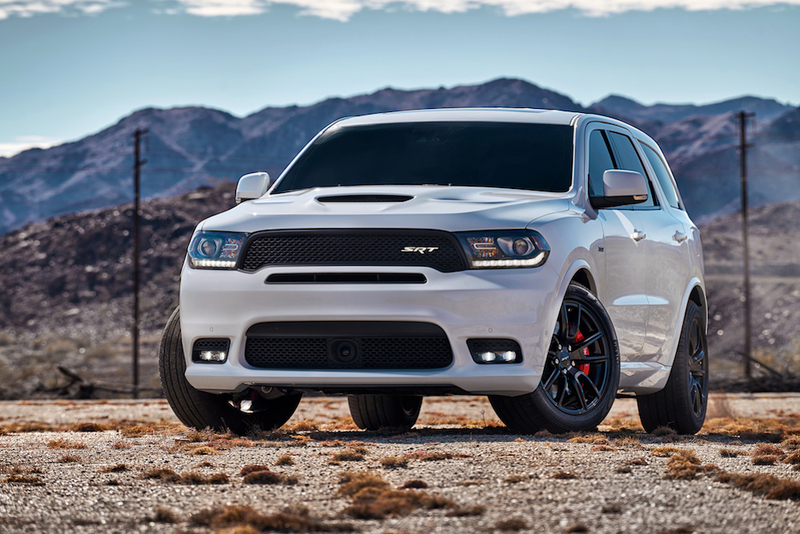 Does the world need the Durango SRT? No, of course it doesn’t. But then it didn’t need the Challenger Hellcat or the Charger Hellcat, and we’re very glad both of them exist. A three-row seater SUV, that’ll do 0-60mph in under 5 seconds, is a very niche product but Dodge clearly thinks there is demand out there.